Fear rippled through the science community in early 2017 as a new president and Congress took office. The shift in ideology was clear—climate change denial, encouragement of anti-vaccination forces and a questioning of the theory of evolution. Research grants and communications from key government science offices, especially those associated with the environment, were suspended. The new EPA administrator quickly moved to scale back science-based regulations and remove scientists from advisory positions. The science community—not just researchers, doctors and academics, but also average Americans—rose up. They organized a March for Science, similar to the Women’s March that happened the day after President Trump’s inauguration. Their goal was to advocate for science, publicly funded research and evidence-based policy. Photo courtesy of March for Science Iowa. Here in Iowa, food safety consultant Jordan Shaw, Iowa State University genetics student Kaitlin Higgins and University of Iowa human physiology and biomedical engineering student Shamus Roeder saw the national movement and decided Iowa needed its own march. They worked with the organizers for the national March for Science, who shared resources such as security and programming plans, logos and publicity ideas. The three Iowans quickly gathered like-minded volunteers and raised money. On Earth Day 2017, as thousands marched in Washington and countless other cities across the country and around the world, 3,000 people turned out at the Iowa Capitol in Des Moines. Under sunny skies, they voiced their views as they walked around the building and heard Iowa researchers and science advocates tell their stories in mini-symposia. The goal of this march was to demonstrate that Iowans care about science at a time when the impending threats to science in our community were beginning to materialize. The new Iowa legislature was considering laws that would have pulled climate change from public school curricula and allowed the teaching of creation science. Another bill would have banned tenure at state universities, a threat to academic freedom and unfettered research. Later, lawmakers cut funding for a research center that investigates soil and water conservation in agriculture and moved another research center that investigates energy conservation to the Department of Economic Development, where it will be subject to the whims of industry. Iowa has a long history of solid science. George Washington Carver earned his bachelor's and master's degrees from what was then the Iowa State College in the 1890s. Iowa State University, as it's now called, is a leader in agricultural research and materials science. The first digital computer, the Atanasoff-Berry Computer, was built there in the 1930s. The University of Iowa is known for its astrophysics program, thanks to the work of James Van Allen, an Iowa native who discovered the radiation belts that ring the Earth. The U of I also has a top-notch medical school and research program. 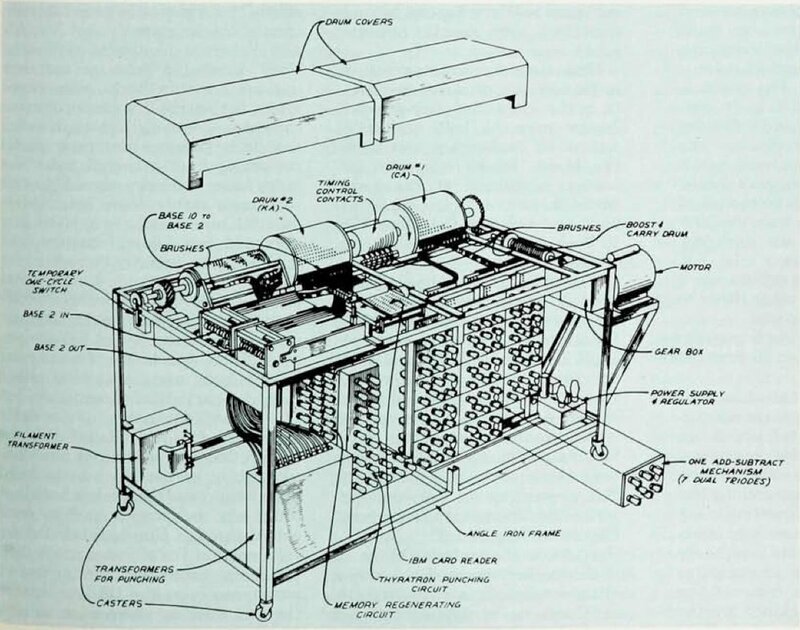 Sketch of the Antanasoff-Berry Computer. Image courtesy of NC State University. Tracy Heath, an evolutionary biologist and professor at Iowa State University, noted that as a daughter of an immigrant from the Philippine Islands, she’s often heard she doesn’t look like a scientist. But “we are scientists and this is what we look like... Science is for everyone and everyone needs science”. As for what it was like—there's an energy that runs through a crowd whenever like-minded people gather for a cause. The crowd included working scientists, but mostly just parents, kids, grandparents—typical people who have benefitted from science and want to support it. The same volunteers organized a second March for Science Iowa to take place on April 14th of this year. This time, the weather wasn’t as cooperative and plans to hear from candidates for Congress, governor and other statewide offices were scrapped. Despite the poor weather and limited publicity, a group of hardy souls soldiered on. This year, we invited people to tell stories of how science affected their lives or what it meant to them, then had a brief march. Ruth Henderson, a science teacher, and her colleague, Phyllis Goodman, a retired science teacher, spoke about the criticism they received when they showed the Al Gore climate change documentary An Inconvenient Truth to their classes. Jordan Shaw related how a close relative died because she chose an unproven health treatment for her cancer. Others discussed their work in research and science. The more intimate crowd meant that people were able to introduce themselves and really get to know each other. After the march, many hung back in small groups, chatting and exchanging stories. In that way, it really was better than the first march. March for Science Iowa, 2018. Photo courtesy of Iowa Science Interface. March for Science Iowa organizers like to say that the group is nonpartisan, but not apolitical. They won’t take sides, but they’re pushing local election candidates to talk about science-related issues. They’ve sent questionnaires out to all potential candidates and are posting their responses online for public access. After the June 5th primary, they’ll continue seeking answers and will work to participate in candidate forums where they can hear candidates’ science-related views. Becoming a national chapter of March for Science is also on the organizers’ horizon, which will make it easier to raise money and will give us a set of rules to work from. March for Science Iowa was already loosely connected to the national organization and to the other marches around the country and the world. Now that connection is more formal, and we can better share ideas and join forces to carry out actions, such as organizing citizen responses to proposed legislation and rules. With these plans in motion, March for Science Iowa is no longer about one day a year. Thomas R. O'Donnell is a science writer, editor and longtime Iowa journalist. In his last position with the Des Moines Register, he reported on medicine and science. He now is the senior science editor for a small Iowa nonprofit. He volunteered to assist with publicity for the 2017 and 2018 marches for science in Iowa, and he blogs about Iowa science developments at iowascienceinterface.com.